All programs can be installed once again, which is also true of operating system. However, the reinstallation of operating system may cause big trouble, for original data might get lost if no recent backup is available. Therefore, files and folders stored on hard drive are always taken as the important possessions and it is necessary to back up files in time in case of any unexpected incidents. It is widely known that the loss of precious data can bring frustrating and anxious situation. Loss of files can be on the account of various reasons such as hard disk failure, virus or malware attack, etc. and the result of all of these situations is same. Your precious files, rare photos, valuable self-made videos, significant working documents and other types of files are gone and disappear. Days or months of hard work can be lost in a moment ahead of you become aware of what happened. It’s really a scary situation. There are a variety of factors that are threating the security of files on computer and other storage devices. Here lists some of the most common factors in order to remain possible data loss. Computer or operating system gets attack by virus. Files or folders are deleted or formatted accidentally. Operating system crashes or can’t boot. Hard drive gets bad sectors and other physical damages. Files just corrupt for no reason. File system goes wrong and partition turns inaccessible. The outstanding features of data recovery software-Eassos Recovery is provided here with details. It supports recover files and folders from formatted hard drive and restores files with original file name. It is able to search for files from hard drives whose capacity exceeds 2TB and relocate lost files and partitions. Its preview function enables you to totally make sure that whether lost files can be successfully recovered. The wizard interface guides the entire recover procedure, which only requires several clicking of mouse button. This data recovery software is compatible of all sorts of storage devices for instance, hard drive, USB drive, pen stick, memory card, cell phone, MP3, digital camera, virtual disk, SSD and more. 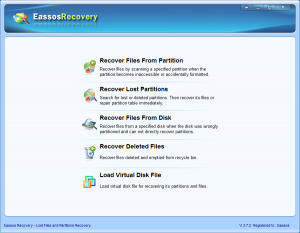 Eassos Recovery offers overall solutions of various problems related to data recovery. After its deep file scanning of storage media, users can regain and restore lost files. It can be downloaded and tried for free, so that lost files, music, pictures, videos, email, database, and programs can be restored within short period of time. All these practice function can save users from frustrating data loss situations and safeguard data. 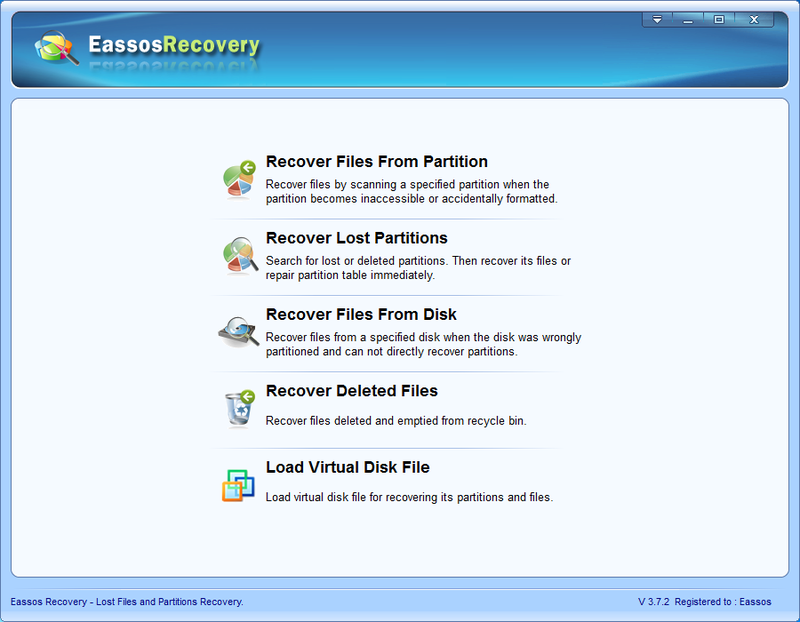 Therefore, Eassos Recovery is the correct and desired data recovery software. This entry was posted in Data Recovery and tagged eassos data recovery software by EASSOS. Bookmark the permalink.